CHICAGO, IL, U.S., November 1, 2018 /EINPresswire.com/ -- Artist Ted Ellis, advisor to Pigment International®, the multi-cultural arts collective, has been appointed to serve on 400 Years of African American History Commission, under the auspices of the National Park Service (NPS) it was announced on October 25. Pigment International’s founder, Patricia Andrews-Keenan submitted a letter on behalf of Ellis, outlining his 30 years as an artist and cultural historian, which led to his selection. The Commission formed by Public Law 115-102 was signed into law on January 8, 2018. It established a Federal commission, to be administered by the NPS, to coordinate the 400-year anniversary in 2019 of the arrival of the first enslaved Africans to the English colonies at Point Comfort, Virginia, on the site of what is now Fort Monroe National Monument. 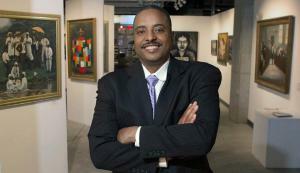 The nomination noted that Ellis is a unique mix of artist and cultural historian who will fit seamlessly into this committee. He is currently a Master’s Degree candidate at Southern University in New Orleans pursuing a degree in Museum Studies. Most of all Ellis, a native of New Orleans, is passionate about his heritage, passionate about his community and passionate about his art. Ellis is one of the 15 members of the Commission, appointed by the Secretary of the Interior, based on recommendations from governors, Members of Congress, civil rights and Historical Organizations, the Smithsonian Institution and private citizens. The Commission is tasked with planning, developing, and carrying out programs and activities throughout the United States to recognize and highlight the contributions of African Americans since 1619, and to encourage civic, patriotic, historical, educational, artistic, religious, economic, and other organizations to organize and participate in anniversary activities to expand understanding and appreciation of the contributions of African Americans. The Commission will hold their first meeting within the next 30 days at Fort Monroe National Monument in Hampton, Virginia and will be active through July 1, 2020. How will you celebrate your birthday?